In advance of taking the Spring ’15 certification maintenance exams I’ve been reading the release notes one more time, with a focus on the broader picture, not just the platform elements and headline features that catch the eye during the pre-release phase. I tend to follow this regimen for every release and inevitably the detail of a number of smaller features/announcements are picked up that were simply skimmed on the first review, or indeed added to a later version of the release notes – this happens (so always check you have the latest version). In regard to Spring ’15 the low-key features of interest relate to Chatter and are covered briefly below. With this feature it’s possible to relate arbitrary records to a Chatter Group via the “Add Record” publisher action on the Group Layout (this needs to be configured). The utility of this feature appears to be twofold; convenience and communication. 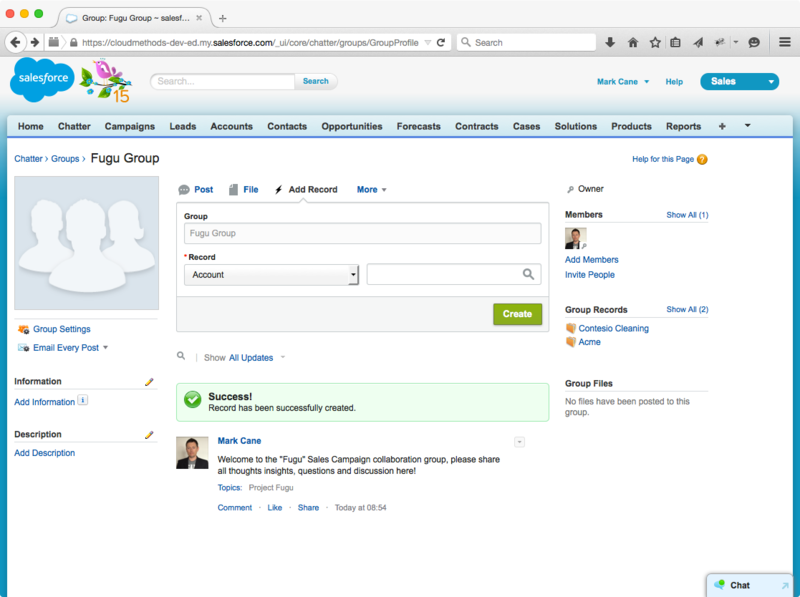 For example, if we have a collaboration group for a sales campaign, we can now list the targeted account records on the group page and access via a convenient link. It would seem that the relationship is one-way, it doesn’t appear possible to view the groups to which a record is related from the record detail page. Note, feed posts at the record level are not shared with the group. 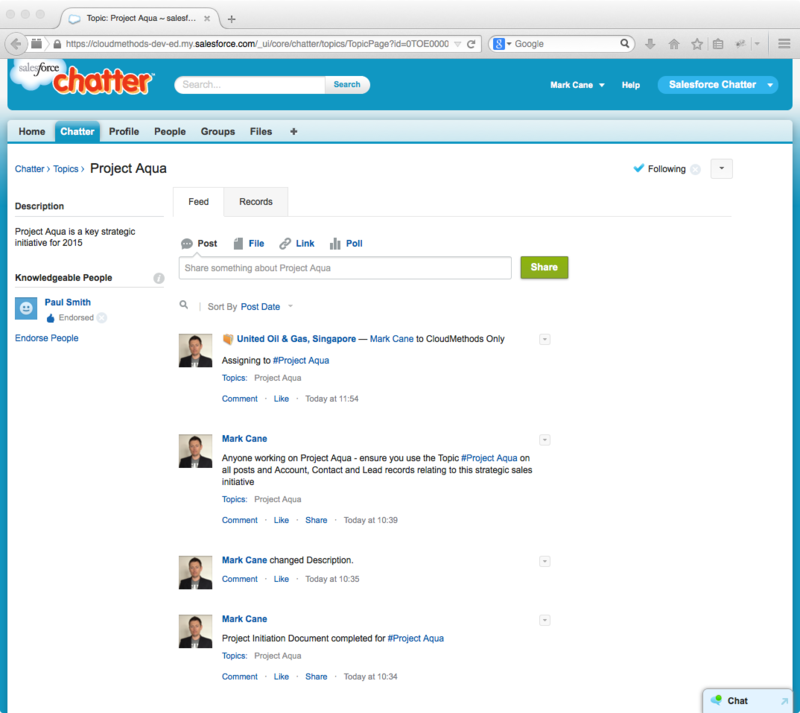 Chatter Questions is a great collaboration feature in its own right, enabling expertise across the internal or external community to be brought to bear on posts structured as questions, with specific functions for answers, mark-as-best etc. As the name implies Question-to-Case allows a question to be escalated to a case from within the feed, with the feed post marked visibly as such. A further extension to this feature, Knowledge Deflection for Chatter Questions is currently in beta. The functionality of this should be evident. Buttons can be added to feed posts that download a file, access a web page or call a 3rd party API. Action links can be grouped within an Action Link Template and packaged for ISV distribution. Action links are functionally very interesting, given the use cases they open-up, however the implementation is non-trivial and warrants a follow-up post. 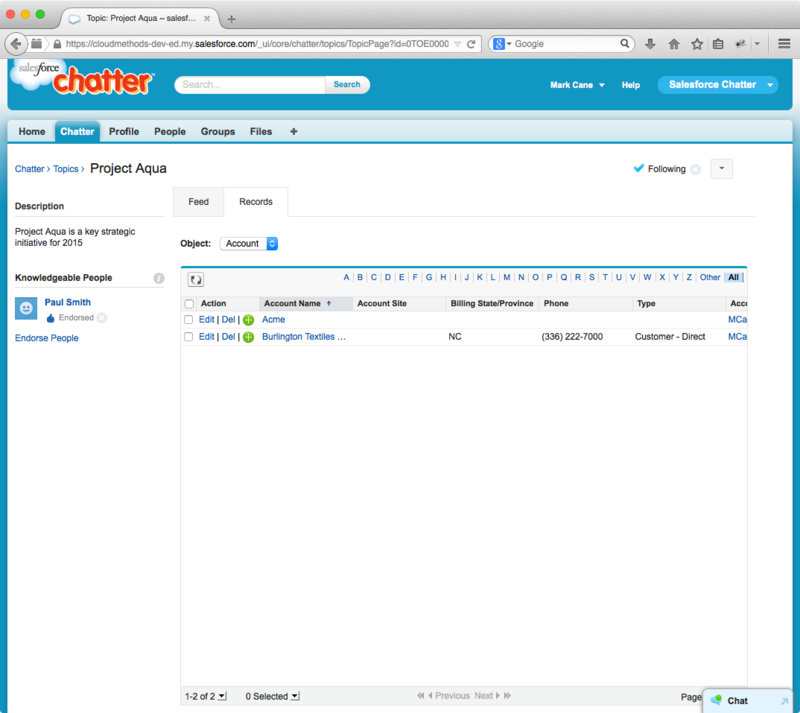 It’s interesting to see how the Chatter product continues to evolve release-on-release. The direction the product is taking appears sensible, i.e. finer grained control via increased Trigger coverage (custom moderation etc. ), richer content previews and extended external integration capability. Top of my wish list incidentally would be an enhancement to Topics to allow post activity from associated records (Topics for Objects) to be automatically shared and pushed out to topic followers via digests. This could be an optional flag that marks the topic as aggregating. With this model, users can simply follow a topic and have content pushed to them proactively that is either directly related (feed post association) or indirectly (feed post against an associated record). Such a feature would really help transition many notification use cases from email/task to Chatter. One of the more interesting (but low-key) functional enhancements to arrive on the Salesforce platform over recent releases is Topics. 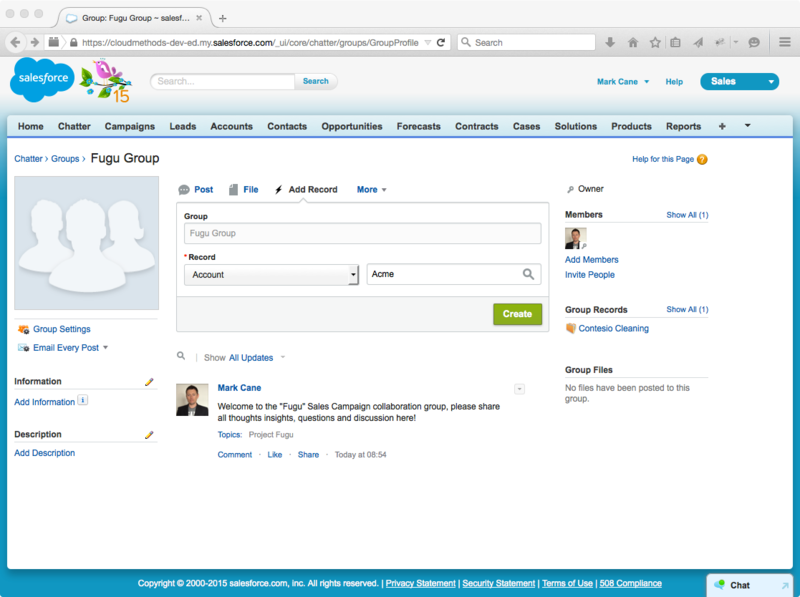 A Topic can be viewed as a consolidation of the collective enterprise intelligence around a specific term or theme, across both the collaboration dialogue and the business processes managed within Salesforce. In practical terms this translates to Chatter posts and Object records being assigned one or more new or existing Topics. All assigned records and posts then display on the Topic page – providing the consolidated view of everything happening across the enterprise that pertains to the Topic. This is incredibly powerful in terms of both data categorisation and the insight possible from considering the holistic view of a contextual theme or initiative. 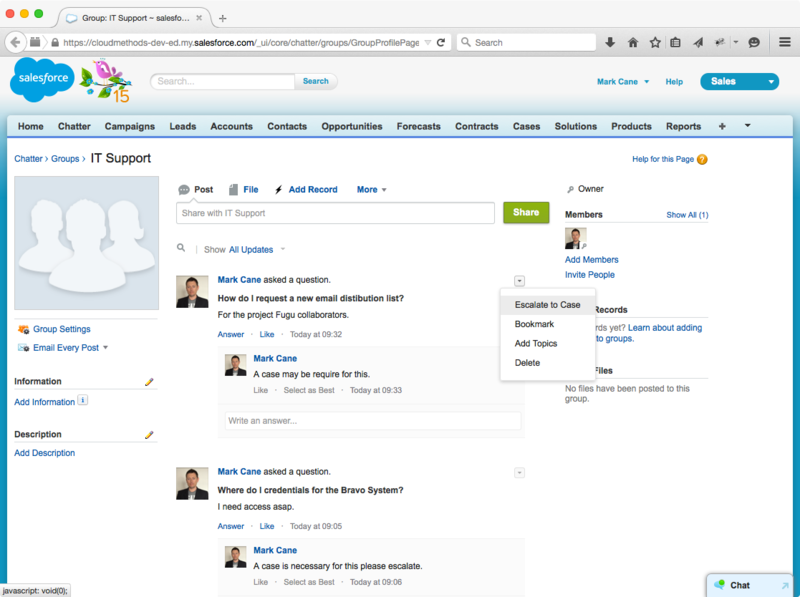 The Topic functionality doesn’t end there; from a Topic page (see screenshot above) it is possible to endorse users as experts on the Topic thereby harnessing knowledge within the enterprise and providing an effective means of channeling communication such as a questions, suggestions and so on. Note, users can elect to remove themselves from the Knowledgeable People list. Topics can be followed (if feed tracking enabled for Topics) and favourited which enables interested users to be updated proactively. 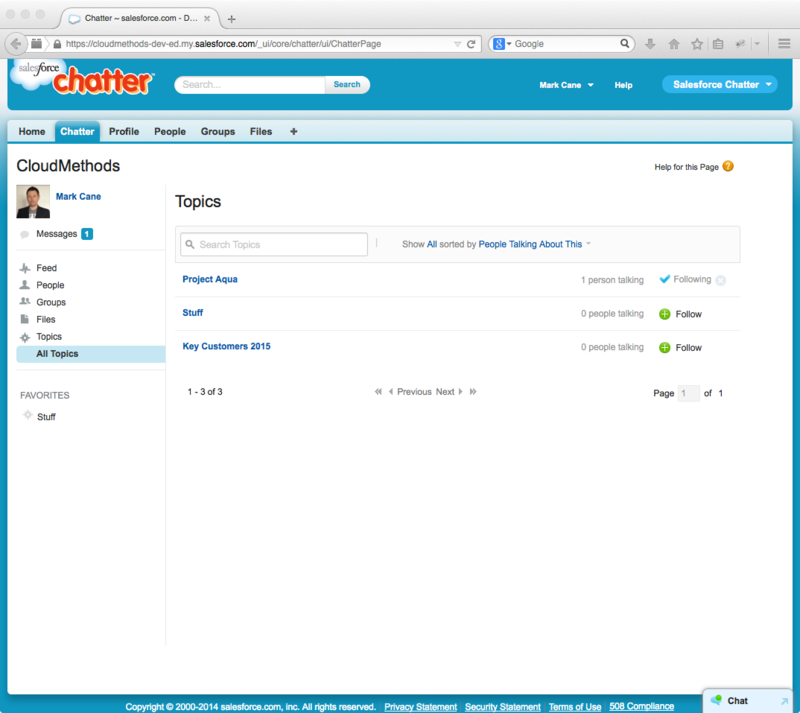 Discussion of Topics is tracked at the Group and User level, the Chatter tab also shows the Trending Topics area which highlights recent activity, this excludes Topic used solely in private Groups or record feeds. Note, as a point of clarification Topics differ from Groups in that they collect posts from across Chatter and also records. 1. Topics provide a good solution option for any data categorisation or notification requirement relating to enterprise-wide initiatives or themes. 2. Topics map well to Organisational concepts such as departments, virtual teams, projects etc. 3. Topics could provide a useful (albeit elective) notifications model where the Topic feed is used to push notifications to users interested in new transactional records related to the Topic theme, which could represent a reference data type such as a region, product or channel. Topics for Object. Once enabled for an object, records can suggest Topics based on the values in selected fields. Whilst a Topic has a feed, record assignment does not generate a post. To mitigate this, Topic assignment can occur via #hastag in a post to the record feed. Additionally, feed activity related to a record is not viewable on assigned Topic pages. The concept relates to grouping and categorisation of records, not consolidation of feed items. Global Search enabled. Topics appear as a distinct Object within the Record search results. List Views. Topics can be referenced in List View filter criteria. Reports. With Winter ’15 the reporting options are limited to those below (to my understanding) via CRT. Reporting on record level assignment isn’t there as yet. Knowledge Articles. Topics can be added to Knowledge articles enabling end-user categorisation of published articles in addition to pre-defined data categories. Customisation. Apex triggers can be defined on the Topic and TopicAssignment (assignment of a topic to a FeedItem or a record) objects, which are also API accessible. Permissions. Profile permissions (or permission set) control who can create, edit, delete and assign topics. Defined topics are public regardless of whether they are solely used in private groups or on records. In the first of a series of short posts looking at interesting aspects of the forthcoming Summer 13 release, this posts explores a new capability to add custom publisher actions to the Chatter UI. In the screenshot below we see the end-result, i.e. 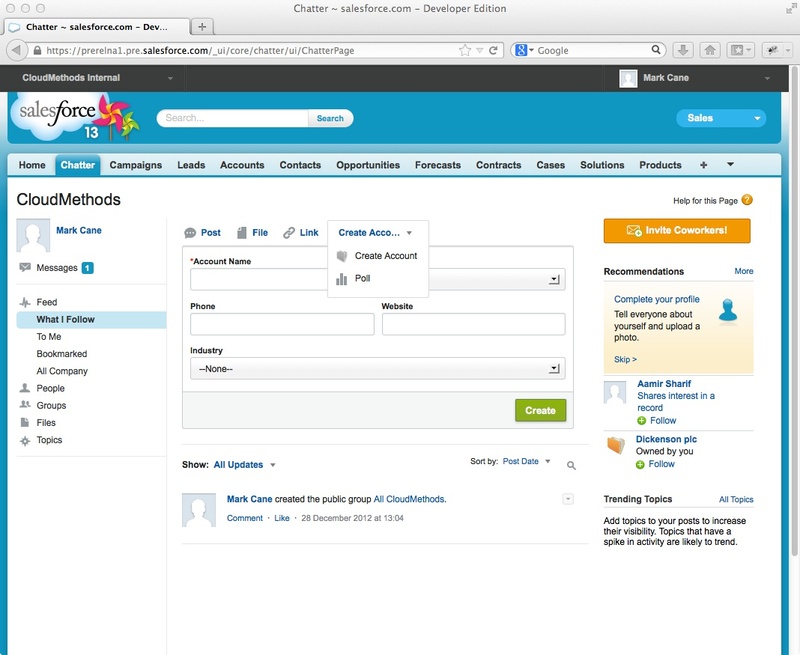 a custom publisher action “Create Account” and the UI displayed when invoked. 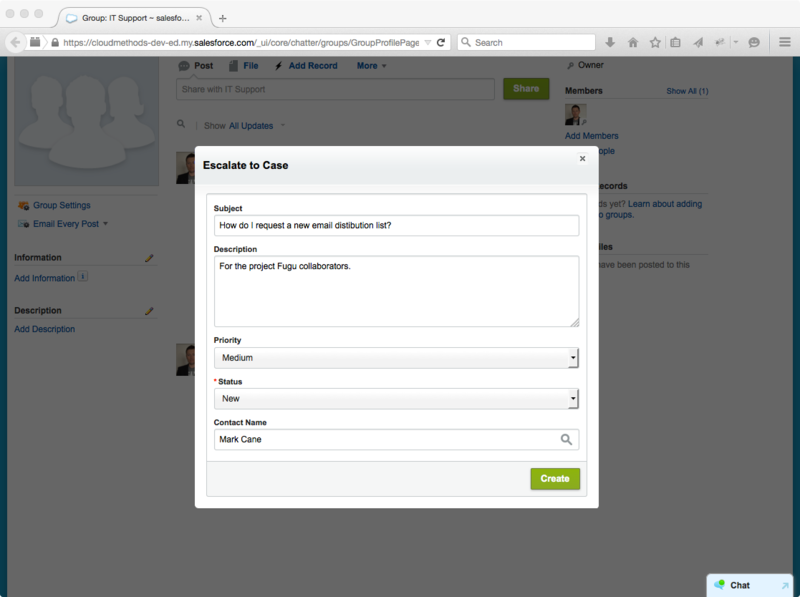 Publisher actions (or Global Actions) come in 2 forms; Create a Record and Custom Action. Create a Record – pick an object, define a layout. Fields can be made mandatory on the layout and given Predefined Field Values, set via formula expressions. 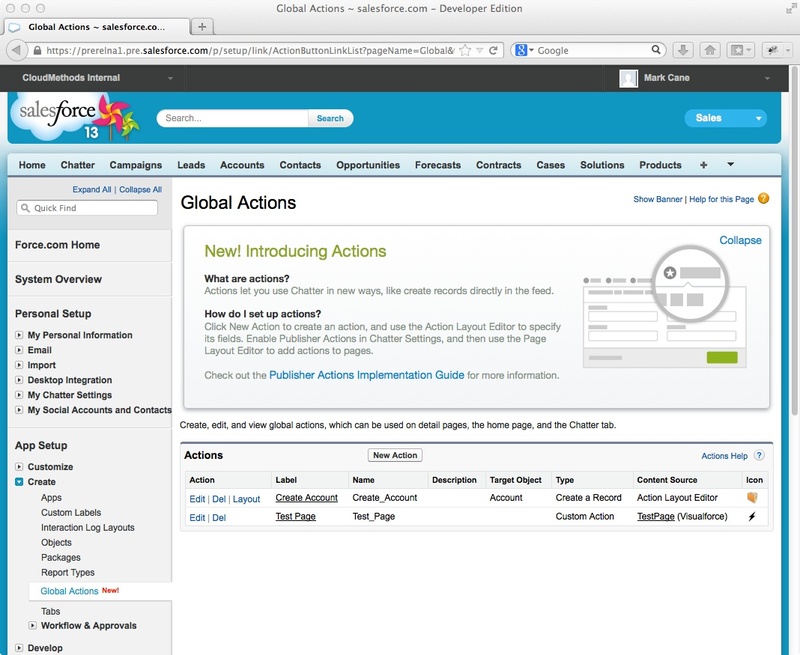 The defined layout or Visualforce page appears as per the first screenshot, in a revealed section beneath the publisher action toolbar. So small, simple displays and basic interactions are in order. The publisher action toolbar is controlled by Global Publisher Layouts which can be assigned per-profile, and optionally overridden in object page layouts, as required. The Global Publisher Layout is the only means to control the actions visible on the Home page, Chatter Home page and User profile page. 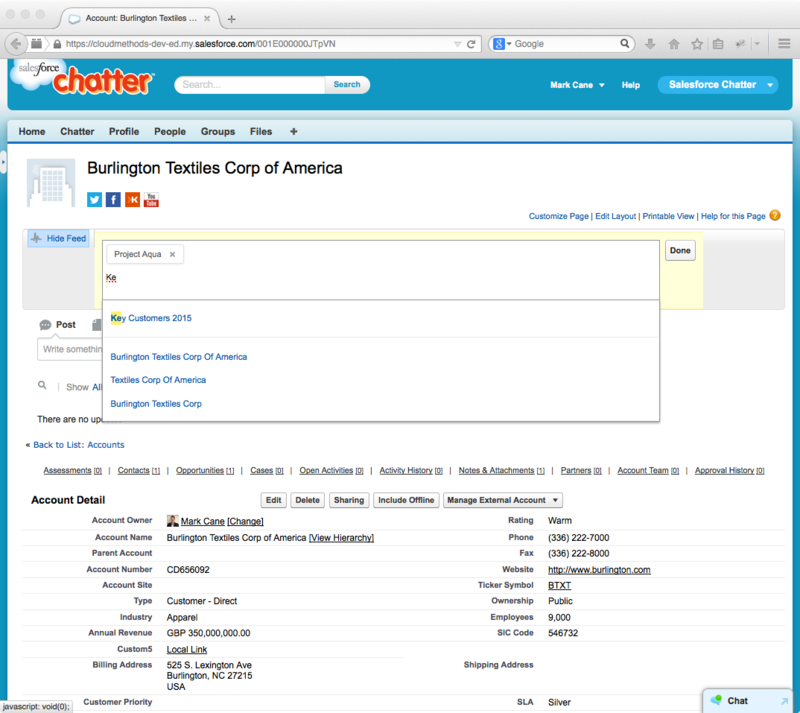 Note, the Enable Publisher Actions option in Chatter Settings must be enabled. I really like this new feature. 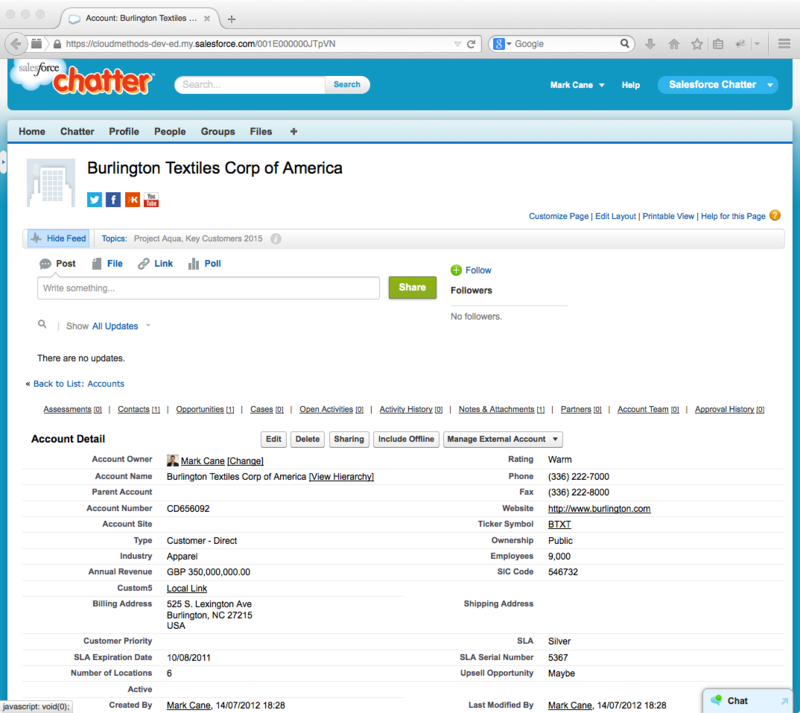 The ability to add custom functionality to the Chatter UI opens up a new category of use cases where business process interactions are supported without leaving the Chatter feed. Collaboration really is at the heart of everything. The Audit9 Blog provides content for Architects, Developers and ISVs with a technical interest in the Salesforce cloud platform and the Salesforce Marketing Cloud. Blog authored by Mark Cane, Salesforce Certified Technical Architect, Certified Scrum Professional and former salesforce.com Principal Consultant. All views expressed are mine and mine alone. All content provided on this blog is for informational purposes only. For information in relation to clearMDM (Pragmatic Master Data Management for Salesforce) - please visit www.clearmdm.com.